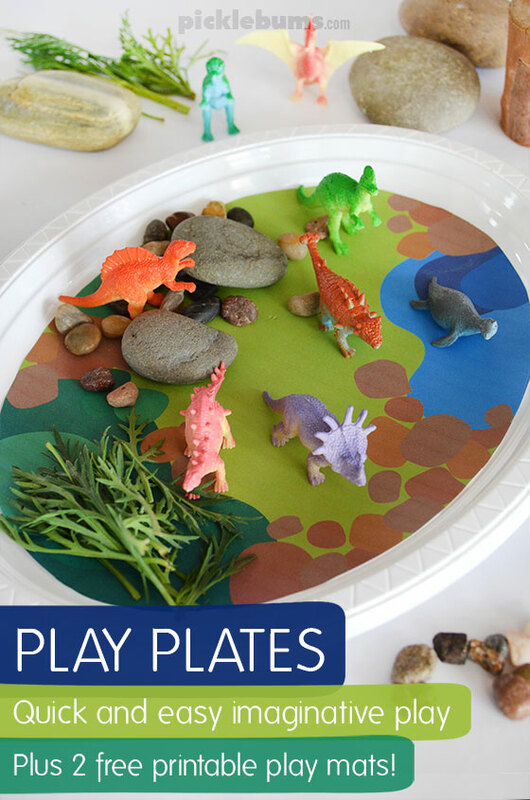 Play Plates – quick and easy imaginative play. Imaginative play is so much fun, and it can engage kids for long periods of time which makes it awesome for parents too! But sometimes you just don’t have the time or the energy to set up a big, elaborate, imaginative play scene. You just need something quick, easy, and portable. 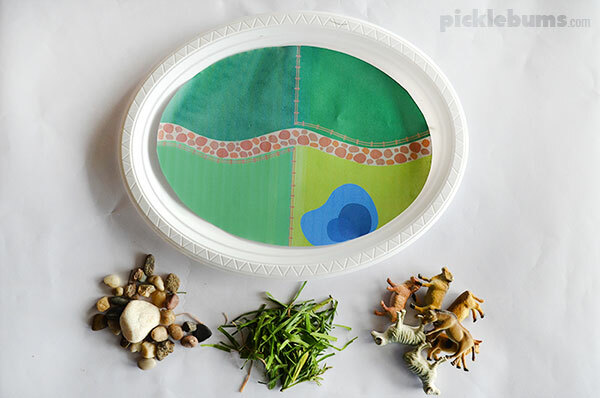 These fun ‘play plates’ are just that – a quick and easy imaginative play option! Our ‘Play Plates’ use a disposable plate to define the play area. Using a plate means the play is more easily contained so there is less mess, and it’s easy to move around. You only need a handful of items to put them together, which means there is only a handful of items to pack up when you are done! Some little animals or figurines. A couple of accessories – rocks, leaves, sticks, gems etc. We used disposable plastic oval dinner plates that we had in the cupboard, but you could use any plastic or paper plate. 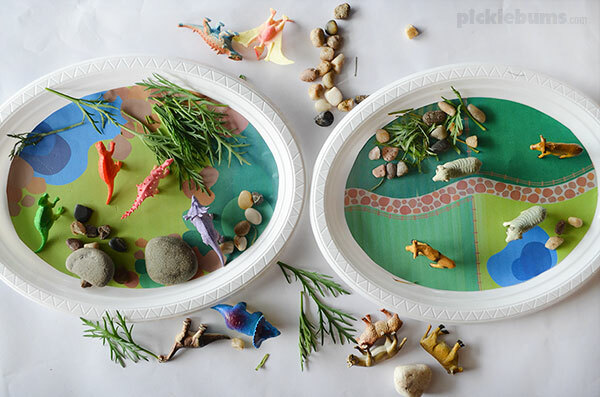 We set up two play plates – a dinosaur play plate and a farm play plate. 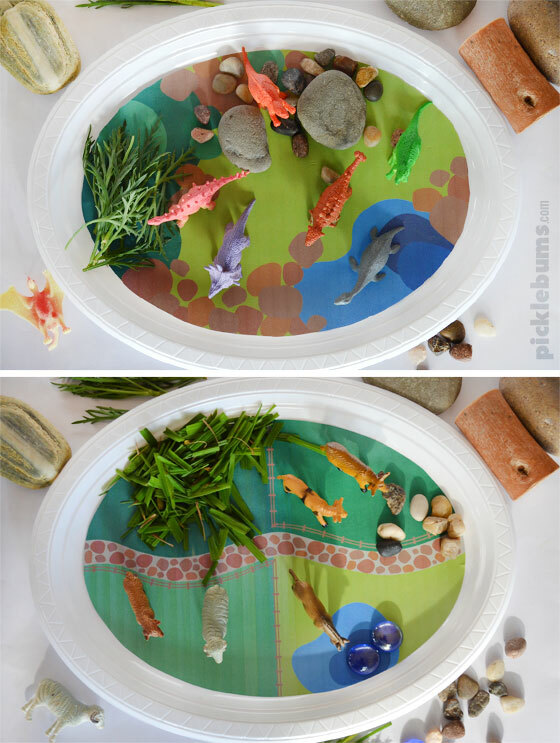 For the dinosaur play plate we made a printable play mat with rocks and a pond. We used a few small pebbles, some leaves from the daisy bush, and a handful of small plastic dinosaurs. That’s it! 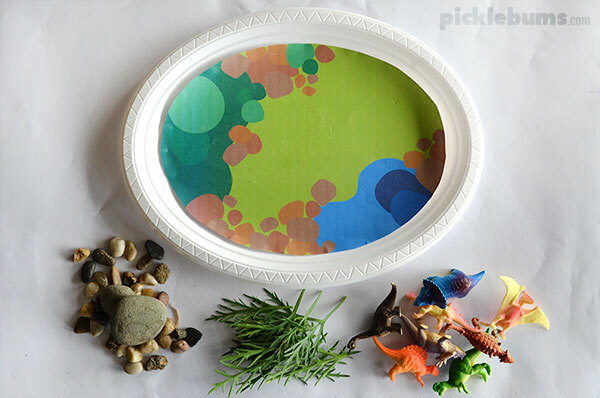 You can download the free printable dinosaur play plate mat here. For the farm play plate we made a printable play mat with paddocks and a path down the middle. We used the same small pebbles, some cut grass and a handful of little farm animals. You can download the free printable farm play plate mat here. Both play mats are A4 sized pdf files, sized to fit a large oval disposable plate, you will need a pdf reader such as adobe acrobat to open them. If you are printing on US ‘letter sized’ paper be sure to select ‘fit’ or ‘shrink to fit’ from your printer options. If your plates are a different size or shape to ours you could cut a piece of coloured paper to fit, or get the kids to draw their own play mat to fit the plate. And you can add whatever accessories you happen to have on hand, just keep it simple! Once you have the plate set up, it’s time to play! 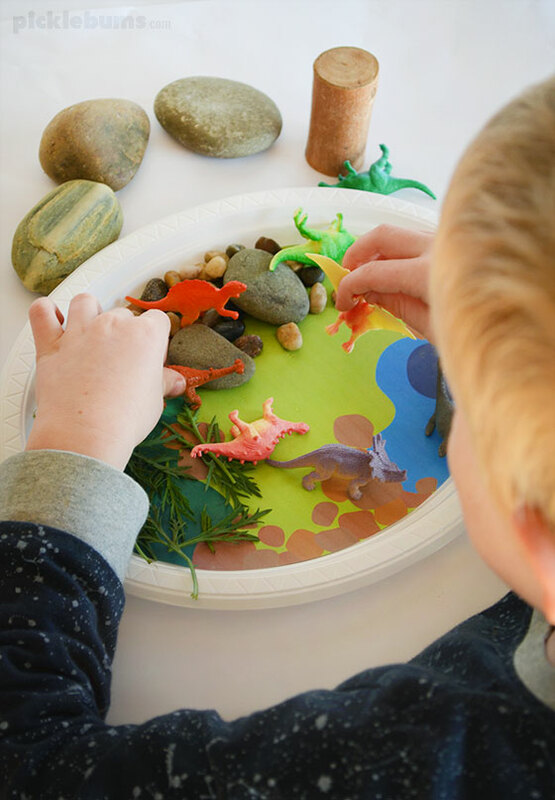 These play plates are so quick and easy to set up, and once you have a couple of plates made it’s super easy to pull out something fun for the kids to do. What sort of imaginative play world will you make on your play plate? We’d love to see your play plates! 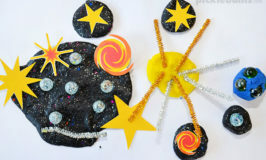 If your kids love using the little play plate imaginative play worlds, we’d love to see some pictures. Tag me on instagram (@picklebums) or share a photo on our facebook page. I love this idea. (Actually I love all your ideas!) Many thanks for sharing. Have you ever done an under the sea one? That’s so cool idea… I am implementing that next week in my school. Thanks a load. 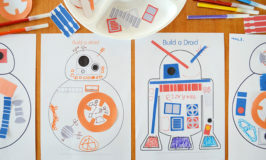 Home » Play Plates – quick and easy imaginative play.